Growing up in a South Indian Hindu household, sandalwood pieces are a very common sight. We have a huge piece of sandalwood that is taken out to grind and get fresh sandalwood paste for all the poojas. 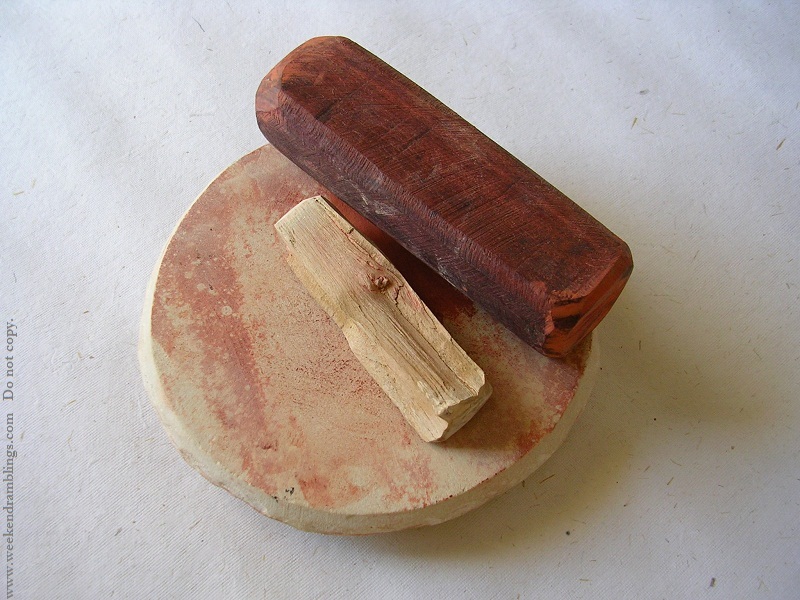 The sandalwood piece is dampened and then ground on a piece of stone, and the paste scraped for use. Types: The regular brown sandalwood is the true sandalwood, is more expensive and more fragrant too. Red sandalwood is actually a different species but called sandalwood (not sure why). Both of these are ground on stone to get the paste, and both pastes are considered good for acne/blemish-prone skin and as skin-soothing agents to help relieve inflammation, especially with sun damage. Essential oil in sandalwood contains beta-santalol - an antiseptic agent. Sandalwood essential oil itself is considered to be useful in controlling blood pressure and pulse rate and to have anti-anxiety effect. It has been associated with anticancer effect in animal studies. Things to remember when using sandalwood on skin: Well, actually it's just one thing that I know - you should never apply sandalwood oil directly on to skin. If using the essential oil, mix it with a carrier oil to dilute it and then use. If using sandalwood paste, I apply a cream or a serum like the Lush Saving Face serum bar and massage it in, then apply the sandalwood paste instead of applying it directly on to clean skin. Available as: Prepowdered and sold in shops - best to buy this from more reliable shops since this would be the easiest thing to adulterate and fake. Mix with rose water and use the paste. Other option is to buy the wood piece itself, again from more reliable shops, but it is little more difficult to sell fake sandalwood (or so I like to believe). It is very expensive and sold by weight, but a small piece would last you a lifetime. Red sandalwood pieces cost a lot less than the regular sandalwood.